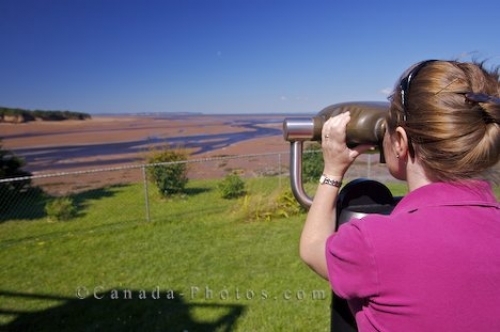 A tourist looks across the Minas Basin in Walton, Nova Scotia through binoculars at the stunning scenery from a viewpoint along the Glooscap Trail. At a viewpoint along the Gooscap Trail in Nova Scotia, Canada a woman gets a closer look at the intriguing scenery of the Minas Basin. As the lush green grass grows in the foreground, the southern section of the Bay of Fundy known as the Minas Basin is covered with silt making fascinating patterns on the surface of the water. Tourist using the binoculars for views of the Minas Basin in the town of Walton, Highway 215, Fundy Shore Ecotour, Glooscap Trail, Minas Basin, Nova Scotia, Canada. Model Released. Picture of a woman viewing the scenery of the Minas Basin from a lookout point in Walton, Nova Scotia in Canada.